On the 27. 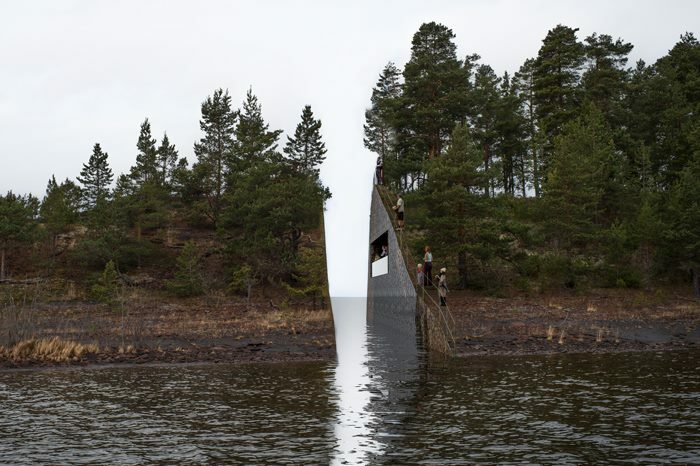 Feb 2014 a national jury (KORO) in Norway announced that the Swedish artist Jonas Dahlberg has been selected to design Norway’s July 22 memorial sites. The image above caught my attention and my reaction was strong. I was bothered, not only because of the reminder of the horror and the tragic deaths of innocents with the loss they left in their wake. But somehow the discomfort went further and deeper. This image represents to me yet another articulation of “man over nature” (like the trees encaged at la bibliotheque national in Paris). A Descartian response. Mind over matter. Again the human projection of their inconsolable grief is taken out on nature. And the jury are willing to make this statement a reality. In a discussion with a British friend he said: “as nature is so important to Norwegian identity this could be a projection of the pain felt; an act of ‘self -harm’ by the people.” Yes – true. I get it, but still my response to him was: “I can see your point – but still I feel it is wrong and I can’t explain it other than from a deep ecology perspective: that “protection of nature is felt and perceived as protection of our very selves” (Arne Næss)”. To make this memorial, they will need to use explosives, and the effects of this and the void will have repercussions on the ecology of this natural site. From an ecological standpoint it is disturbing to create an eternal sore that will still be remembered in seven generations. Could we have imagined the opposite, a mound that grows over time with growth as proof of some sort of healing? But no, this statement leaves no room for any future healing, no reconciliation possible… As a concept this proposal is indeed incredibly rich in affect, yet the thought of this actually being produced has left me with the following question: Do we need a memorial of the human ability to self-harm? The jury have made their decision, my ‘jury’ is still out. I cannot find peace or closure at staring at this void. But perhaps starring at the horizon beyond will make sense at some point?